Happy Thursday! I love summer dresses! I would say that I wear quite a few summer dresses because they are so easy to wear. 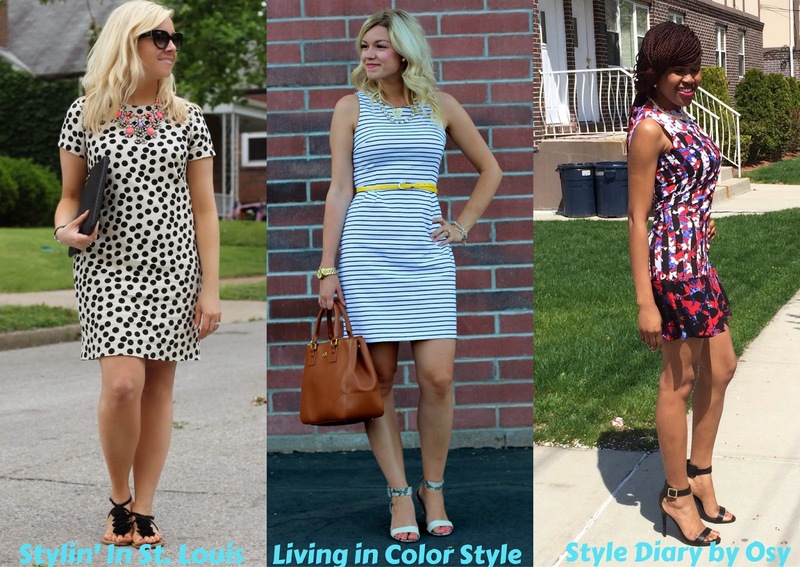 (especially on hot days) Come share you summer dresses with Elle and I! 1. We kindly ask that you follow the two hosts: Elle from Living in Color Style and Jacqueline from Stylin' In St. Louis via Bloglovin or GFC and of course Osy our co-host of Style Diary By Osy . Spotlight: Our spotlight of the week is Whitney of Whitney Nic James blog! Whitney's outfit is so summery and full of beautiful colors! We love her sunglasses and how she styled them perfectly with her gorgeous dress! Nextweek: Next week our spotlight weekly theme is shorts! Thanks for linking up! See you next week! Looking good, babe! Love that statement necklace! Love love love your polka-dot dress! And the necklace is a great pop of color. Well done! Such a cute look! Love the polka dot dress! You look FAB in this dress! Thanks again for the spotlight...I truly appreciate it! XO! What an awesome dress! You can't beat J. Crew. Love the statement necklace with it. Thanks for the link up! That is one J. Crew dress that will never go out of style....love the fun polka dots!!! Love the statement necklace against this black and white polka dot dress. Just gorgeous! The polka dot dress is more than adorable on you! Thanks for hosting the link up! love the polka dots! all of my polka dot dresses are a color with white dots, but i like how yours is mostly white with black dots! That statement necklace is so gorgeous with the polka dots! Love this dress on you. I tried it on and it looked awful on me. The dots on this dress is so fun. love a good summer dress!! yesterdays post was all about the LWD!! I love this dress! The shape and print are perfect! I'm starting to wear more dresses :) They're so stylish, easy and comfy for hot summer days! Love all the dresses you all posted. You all look amazing. I love this dress! And it looks super cute with the fun necklace! Such a pretty dress! I love the pop of color with your necklace too! The polka dotted dress and the blue striped dress at the top are so cute, I'm absolutely in love with them. Such a cute dress! I love it! And that necklace is fantastic! love the dress and the necklace! brightens the look! Such an awesome dress! Love that gorgeous necklace with it! What a fun dress, and your accessories are perfect with it! That necklace is to die for!! Thanks so much for hosting the link up!